Open the Hotmail Sign Up Page or visit "https://www.hotmail.com/". And then Click on "Create One". Type your Name first and last name. Type the username that you want to use for your Hotmail account. And choose your preferred mail ending (Either"@hotmail" or "@outlook") by clicking on the small down arrow on the right of username box. Type your password. Do not use dictionary words. And enter it again under ‘Re-enter password‘. Select your country, enter your date of birth and gender. Select your country code and enter your mobile number and alternative email(if you have any) in the respective box. This information you enter for Hotmail sign up is to increase the security of your account. It's also helpful when you forget your password or username or have any problems to access your account. 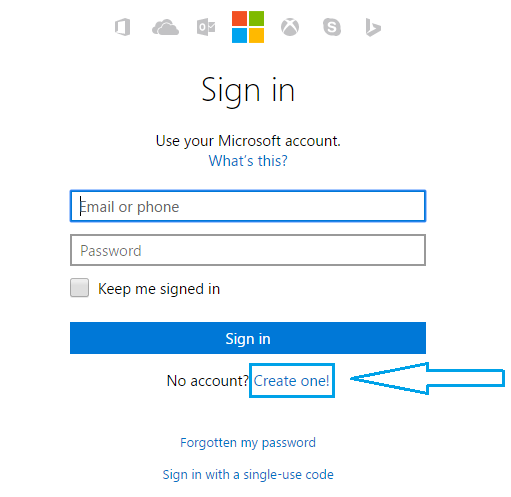 Enter the Captcha code and Click on "Create Account" and Your Hotmail account sign up process is completed.